Video interviews, panel discussions, articles and Q&As featuring Richard Lau. NamesCon offered valuable insights to domain industry trends, and crypto currency was a big topic, both on the stage and between all the attendees. Hear experienced brokers Drew Rosener & Jen Sale as they analyze trends and discuss the future in the Crypto Meets Domaining Fireside Chat, hosted by Richard Lau, from Tuesday, January 30th. • One Sherpa snags a domain for $5k that Richard Lau thinks could be worth as much as $500k; Selling Spanish .com domains; The Soft .net market. We’re joined by Andrew Rosener, Richard Lau and Shane Cultra. It’s rumored but not confirmed that today’s Sherpa sold a five letter, dictionary word domain name that has hundreds of thousands of exact match searches per month, and thousands of companies use this word in their name…but nobody’s been able to confirm the sale or the price. 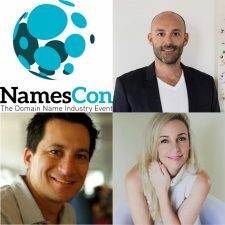 My favorite way to meet people is in person, and next week I’ll be in Las Vegas for the third annual NamesCon domain name conference, which promises to be a blockbuster event. I’m making a list of what I need to do to prepare for next week, so I thought it was a good time to chat with the founders of NamesCon about what’s going to happen, what we need to be ready for, and how we can make the most of the event. Get a notepad ready, prepare properly, and see you next week! In 1995, Richard Lau registered several domain names that he simply thought were cool, but never considered would be worth thousands of dollars. His portfolio attracted the attention of Microsoft, who tentatively agreed to pay $9,500 for one of his domains. That gave him an inkling he was on to something big. Later, after spending 80 hours per week building one of the first 30 domain name registrars in the world, he was faced with stage A colon cancer and a series of unfortunate business liabilities. In this biography, Richard Lau discusses how he learned the industry, tells some fantastic stories, and provides guidance to others that are just starting out.